This is a second Adventure Module for Cutthroat Caverns that uses a 'choose-your-own-path' style book to overlay an exciting new dimension to the game. The first such book was introduced in the boxed expansion, Tombs and Tomes, and features a fun narrative in which characters have to make real decisions that will effect the outcome of the story, solve riddles, overcome traps, encounter familiar creatures in a whole new way -- and, importantly, will face new winning and/or losing conditions. The result is a slightly longer, but richer gaming experience. 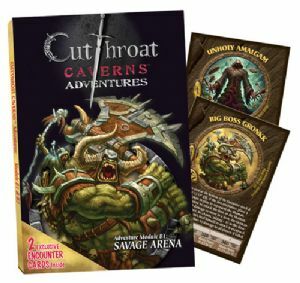 The book comes with two all new Encounter Cards exclusive to this adventure, but fully usable in the core game as well. The Encounters are new 'Boss' type encounters that, when discovered in the core game's Encounter deck, will do something 'bad' to the party before being placed at the bottom of the stack to be faced as the final encounter. You and your party of adventurers are chained, neck to neck, as prisoners of Big Boss Gronkk. You must work together to survive a lethal coliseum of traps and monsters before the strongest among you earns the right to win your freedom. Your mysterious employer sends you to the stronghold of his rival to steal everything you can, for among his treasures is the one relic that can restore his misshaped body. The relic can change form, so you need to bring all you find -- but will his secret be your undoing?